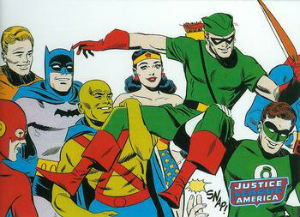 In 2009, Rittenhouse produced a commemorative card set that paid homage to the Silver Age run of DC's Justice League. The limited release totaled only 6,000 boxes. 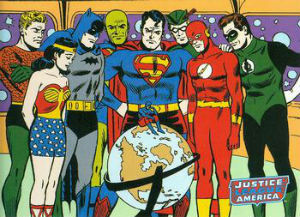 Using comic book imagery from 1960 to 1969, 2009 Rittenhouse Justice League Archives is a thorough retrospective of the team's origins. 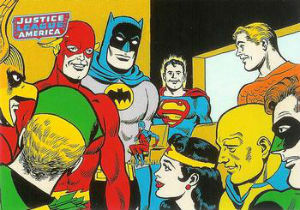 With the exception of issues 39, 48, 58, and 67, all of the first 73 issues of Justice League of America, as well as the three The Brave and the Bold issues, are represented. The four books not featured in this set were 80-page special editions consisting of three reprinted stories from previous Justice League books. 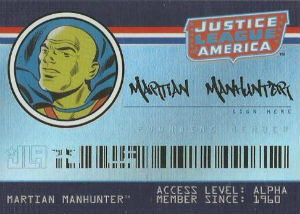 Each card, printed on quality stock and featuring full-bleed drawings, has an image from a Justice League title on the front and the cover/release information of the image's source on the reverse. 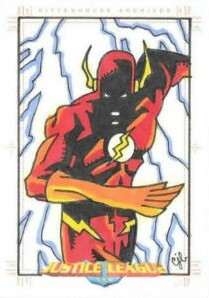 Beyond the 72-card base set, 2009 Rittenhouse Justice League Archives also includes three chase sets. 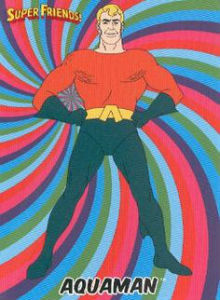 The 18-card Super Friends insert features character designs from the popular 1970s cartoon on the front and piece together to make a puzzle on the reverse. Founding Members cards are designed to look like ID badges and offer seven options. Each foil card has a head shot and facsimile signature of one of the original founding members on the front and a fingerprint and bar code on the reverse. 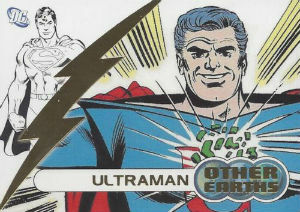 The six-card Other Earths set includes characters from Earth 2 and Earth 3 alongside their more well-known counterparts. The design of this chase is very similar to that of the Rittenhouse DC Legacy set. Among the most premium options in the release, 39 different artists contributed original Sketch cards and they average one per box. 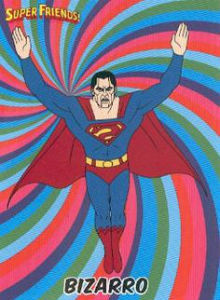 As with most Rittenhouse products, there are also case incentives that were available with larger purchases of 2009 Rittenhouse Justice League Archives. These cards are incredibly rare and very difficult to find. 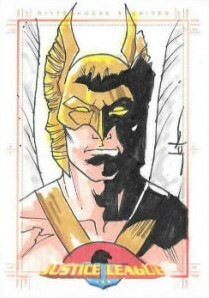 Every case (that's 12 boxes) yielded an autograph card from legendary Justice League artist, Murphy Anderson. Hand-painted cards by Felipe Massafera and Bard were included with three- and nine-case purchases, respectively, and an 18-case purchase included one sketch card from each of the 39 artists. Rittenhouse also offered a collector's binder themed to match the set which included an exclusive promo card. 7,933 total cards. 1:24 packs. Specific print runs noted for each artist.